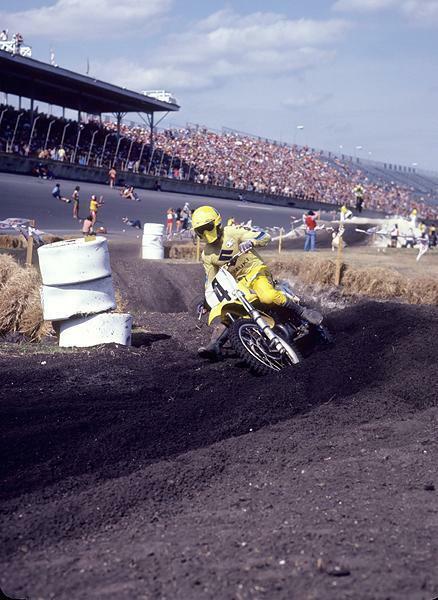 Welcome back to the forty-day countdown to the 40th year of American motocross. The 2011 Lucas Oil AMA Pro Motocross Championship begins on Saturday, May 21, at Hangtown in Rancho Cordova, California. Racer X Online is counting down the days and years to the opener by reviewing each of the previous seasons of AMA Motocross. Today we focus on 1980 and a changing of the guard. The previous season ended on a somber note, as highly respected veteran Gaylon Mosier, winner of the '79 High Point 500cc National on a factory Kawasaki 500, was killed in a training accident near Unadilla before the Trans-USA race there when he was hit by a truck while riding a bicycle. Gaylon Mosier was killed in the fall of '79 while bicycling on a road near Unadilla. In 1980 a couple of new tracks joined the AMA Motocross circuit, and one is still there: Washougal, high above the banks of the Columbia River, will host its thirty-first Lucas Oil AMA Pro Motocross National on July 23. Broome-Tioga in Binghamton, New York, also joined the tour and would remain on it for more than twenty years. When Bob Hannah broke his leg water-skiing after another dominant season, the door was wide open for someone to step in and take over as the leader in this nation. In AMA Supercross it was Hannah's young Yamaha teammate Mike Bell who ended up champion, as he swept the first two rounds at the old Seattle Kingdome and then rode a good, consistent series—and by then the SX tour had grown to seventeen rounds! 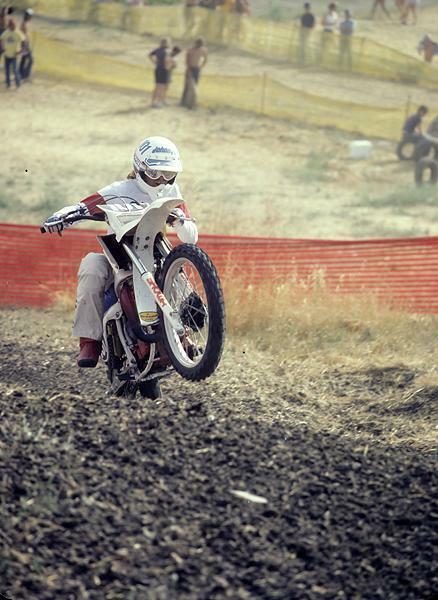 Kent Howerton took the 1980 AMA 250cc Motocross title. Bell was solid outdoors too, but not as fast as Suzuki's Kent Howerton was. The “Rhinestone Cowboy” from Texas won all but one round of the seven-round tour, and the only race he lost—RedBud—went to another Texan in the form of Team Honda's Steve Wise. Howerton would also win the Trans-USA tour, now all the way down to just four rounds, including two current AMA National tracks in Unadilla and RedBud. There was not a single European rider in the top ten that year, as the series was no longer of great importance to the factories. The 500-class title would go to Chuck Sun, nicknamed the “Rising Sun” due to his Asian roots. The Honda-backed Sun, who hailed from Oregon, was the first minority rider to win a major AMA title and would not be matched until James Stewart came along in 2002. 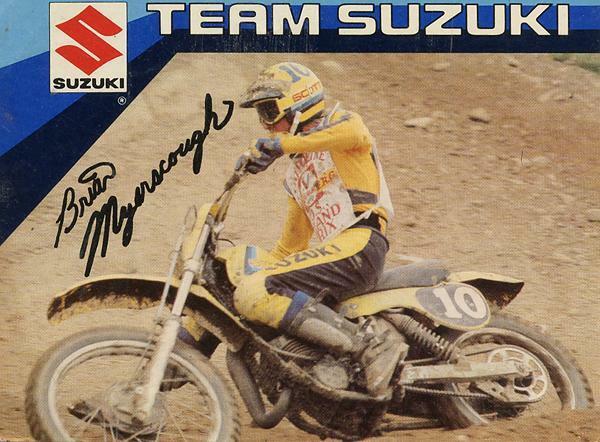 Sun topped Goat Breker and the veteran Marty Smith, now on a Suzuki after spending most of his career at Honda. One other moment that year is mostly lost to history: Ohio's Denny Swartz won the RedBud National on a Maico, marking the last win in the once-proud German brand's history. “Flyin'” Brian Myerscough was fast but also had some health issues. The 125 class saw the biggest upset, though, as three-time champion Broc Glover was finally stopped in his tracks by Mark “The Bomber” Barnett, as the Suzuki rider ended the Golden Boy's dominant streak. He had some early support from teammate Brian Myerscough, but the former minicycle hotshoe suffered from blood disorder called hypoglycemia that robbed him of his energy, though he did win the Saddleback National. 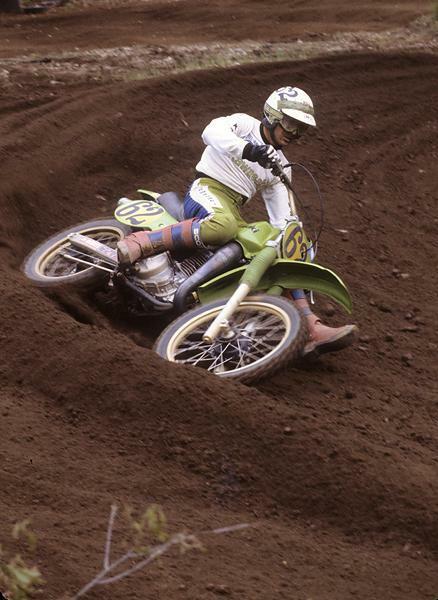 Nineteen eighty was a big year for American motocross on the global stage. Brad Lackey was in contention for the 500cc FIM World Championship, Marty Moates shockingly swept both motos of the U.S. Grand Prix at Carlsbad on a privateer LOP Yamaha to become the first American to win that race, and in another huge upset, Mugen Honda privateer Johnny O'Mara won the 125cc U.S. GP at Mid-Ohio. But Team USA could not get their act together, and for the second year in a row there was no U.S. entry at the Motocross and Trophee des Nations. That would change—as would the balance of power in world motocross—in 1981. More on that tomorrow. Check out Johnny O'Mara on that sweet Mugen Hon! 2011 MX Sports Pro Racing, Inc. All rights reserved.